"The situation was very complicated. The dilemma the government faced was breaking its commercial, economic and political ties with Saudi Arabia, with the impact this could have in some areas of the country, such as the Bay of Cadiz, or carry out a contract signed by the previous government," Sanchez told private television broadcaster La Sexta, quoted by AFP. Earlier in September, media reports asserted that the Spanish government had canceled the sale of 400 laser-guided bombs to Riyadh amid concerns that they would be used in the Saudi-led coalition's strikes against civilians in Yemen. The original sale with Riyadh was reached in 2015 by Spain's former conservative government. In August, the Spanish Foreign Ministry suggested that Madrid would reconsider supplying arms to Riyadh and other members of the Saudi-led coalition amid deadly airstrikes on civilian targets in Yemen. The statement came after reports that Saudi-led coalition warplanes struck a school bus at a busy market in the northern Yemeni province of Saada, a stronghold of the Houthi political opposition engaged in violent conflict with the current Yemeni government in exile and supported by the coalition. The strike killed at least 50 people and wounded another 77. Over half of those killed were children under the age of 15. According to AFP, the cancellation of the sale of laser-guided bombs would jeopardize a much larger order for five Corvette warships — a sale worth 1.8 billion euros — to be built by Spain's Navantia shipyard in the southern region of Andalusia. Workers in the region, a stronghold of the ruling Socialist Party, had reportedly staged demonstrations pressing for the deal to go ahead as a means of job security. Apart from the warship contract, Madrid has struck engineering deals to build a high-speed railway linking Mecca and Medina, as well as a metro in central Riyadh. Over the past year, Spain has supplied some 361 million euros (over $411 million) worth of weapons to Saudi Arabia and its Gulf allies who have supported the Yemeni government in exile in its fight against an armed Houthi political opposition faction since March 2015. 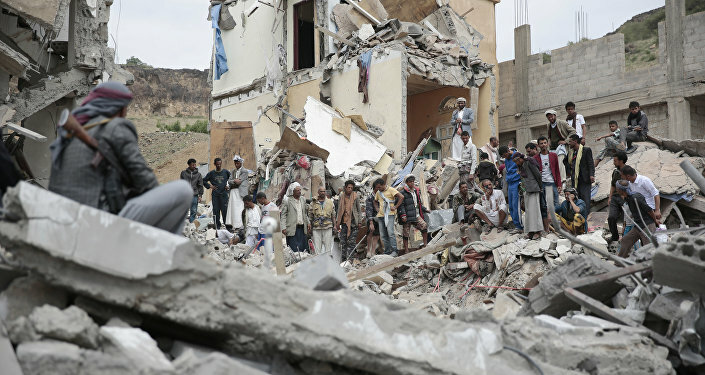 Human rights watchdogs have dubbed the war "the world’s largest humanitarian catastrophe," claiming that since joining the conflict, the Saudi-led coalition has conducted continual airstrikes against civilian targets, many of which amount to war crimes.